If your home has a brick walkway, patio, or other surface, you may consider hiring an experienced service provider to get rid of brick stains. Desert Tile & Grout is an Arizona-based expert floor cleaning company that has serviced clients throughout Phoenix and the East Valley. Our professional company cleans, seals, and enhances brick to bring out it’s true color and beauty! Restoring brick surfaces is a very easy way to rejuvenate an entire building or area. Whether it be a brick facade, or a walkway made of brick, their is no simpler and easier way to make it sparkle like new than to have it restored by Desert Tile And Grout Care. With over 15 years serving Phoenix, Gilbert, Chandler, Mesa and other cities in the Valley, owner Dan Milne has built a reputation as one of the premiere craftsmen in the brick restoration and cleaning industry. 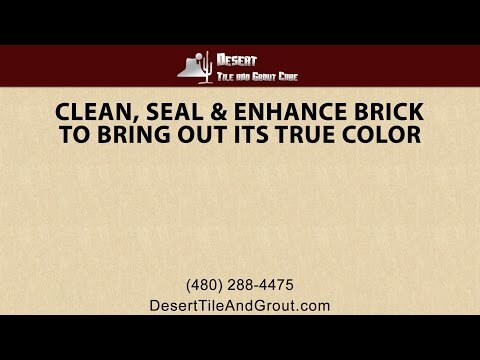 Desert Tile & Grout can clean, seal and enhance brick to bring out its true color! Often times brick surfaces can fade over the years, and the grout can become discolored. In some cases, the brick may even become stained or discolored, in which care professional care is a fantastic option for any property owner or property manager looking to bring back the good looks of their real estate. In many cases, the brick surface can be brought back looking even better than new, as the sealing allows the true color to really shine through. Don’t settle for faded facades or walkways – call Desert Tile and Grout Care today, you may be shocked at just how easy and affordable it is to have your brick cleaned, sealed and restored. If your outdoor kitchen, patio, fireplace, or other brick surface could use an upgrade, don’t remodel – contact our professional team to see if your home would benefit from brick restoration services. Our company has worked with countless homeowners to make their floors shine. Call us today to learn more! Desert Tile & Grout Care provides floor cleaning services for ceramic tile, marble, stone, Mexican tile and brick floors in the Phoenix metro area including Mesa, Chandler and Gilbert.